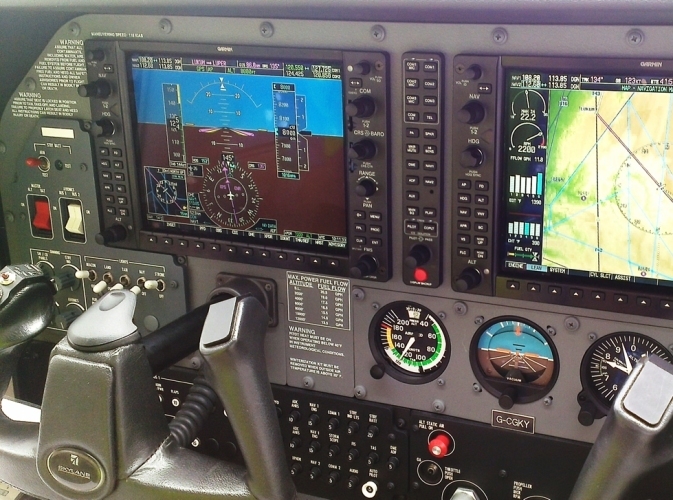 EFIS can take many forms, from many different manufacturers. We regularly train people in aircraft equipped with EFIS, ranging from standard General Aviation types (such as Piper, Cessna and Cirrus to name a few) right down to Sports Cruisers. The types of EFIS varies (as a general rule) to the size of the aircraft. For example, standard GA types tend to have Garmin (such as the G1000) or Avidyne with G430 or G530. Smaller aircraft may have the likes of Garmin G3X Touch, or MGL. You'll be pleased to hear that whatever you have, we're more than happy to train you. In particular we are experts in the Garmin range. Difference Training for EFIS generally comes with a two-stage sign-off. Stage one usually comprises flying VFR on the basic presentation, including communications, basic GPS navigation and basic auto-pilot. We know too well the pit-falls that happen with people transferring from "Classic Instruments" to EFIS - so we'll point these out to you! Theoretical Training on the type of EFIS is included to understand system failures, what they look like (we'll give you some for real! ), and how to cope with them. Stage two covers the more advanced features of your system, including configuration of the display, and presentation of conventional navigation aids and their use within EFIS. We also look more closely at flight planning, the Autopilot and Flight Director modes, and (if you're qualified to do so) Instrument Approaches. Legally, you should obtain differences training for each type of EFIS installation (e.g. one for G1000, and another for Avidyne). The conversion time is quite variable, depending on your type of EFIS. Although there is no legal minimum training time before sign-off, we will only certify your difference training once we are satisfied of your competence. Some people take more time, and some people take less! It's down to the individual concerned.